WarcraftPets 2015 Community Meet-Up at BlizzCon! Unfortunately, none of our Admins were able to attend BlizzCon this year. 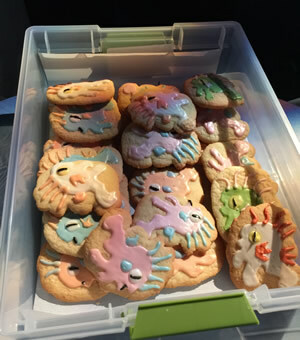 However, Marzena, one of our awesome MVPs and the baker and bringer of delicious murloc-themed cookies (pictured right) for the past two BlizzCons, has kindly taken on the task of hosting the WarcraftPets Meet-Up, giving attending pet collectors a chance to meet in person to talk pets, battle strategies and trading. Be sure to follow our Twitter and Facebook pages for updates and announcements as the event draws nearer! There will be a sign-up sheet at the Meet-Up, and we'll be holding a raffle for some sweet mystery TCG pet loot. To be eligible, simply sign the roster with your WarcraftPets username. The prize drawing will be conducted the week following BlizzCon and the winner will be contacted by email. Good luck! Hello everyone! All your sweet comments totally made my night! Thank you so much for visiting the meetup! Thank you for all your sweet comments too! It was so lovely meeting you all! I was honored to take up the offer to do the meetup, I love meeting new people, and especially talking about WOW and all the amazing pets! I'm going to send pictures soon so keep watch! it was great to meet you marzena. thanks for the meet-up and the cookies!! I am so happy that I saw the Warcraft Pets Sign while waiting to add to my plushie collection. It is nice to meet people that I have or will play with. Will you be posting the Pictures that were taken at the event? Marzena, the cookies were amazing! I had the blue one and it was yummilicious. Your making our "meet and greet" happen is so appreciated. Simply wonderful to meet you all. I was with friends and could not stay long but so lovely to put beautiful faces with names. Thanks for having these meetups every year! It's nice to include a little pet commaradrie in the 'Con. Nice meeting Marzena! Woot!! So excited to meet folks!!! Those murloc cookies look amazing. May the meeting go well and everyone have a ton of fun! What about us poor souls who couldn't get to Blizzcon this year and have to sufffer with a Virtual Ticket ;-). Enjoy the cookies and the convention though - I had such a blast last year. Go and play Overwatch :), its a real fun game. If you want anything from the Blizz store, go there ASAP, otherwise the lines are horrific as in 3-4 hours wait time. The cookies were SO good last year. Can't wait to say hi to you guys again this year! Woot free cookies! Why shame the generosity of people willing to give away prizes and cookies? Let them do their Blizzcon thing they dont have to include the world in it thats the purpose of a MEET and greet. it would be nice if Virtual Ticket Holders had a chance of getting the TCG pets.. i live in the UK, am a pensioner, and cannot afford to physically fly to the States. So i am unable to meet up, and sign anything.. Sigh... Is it possible to somehow make that possible?